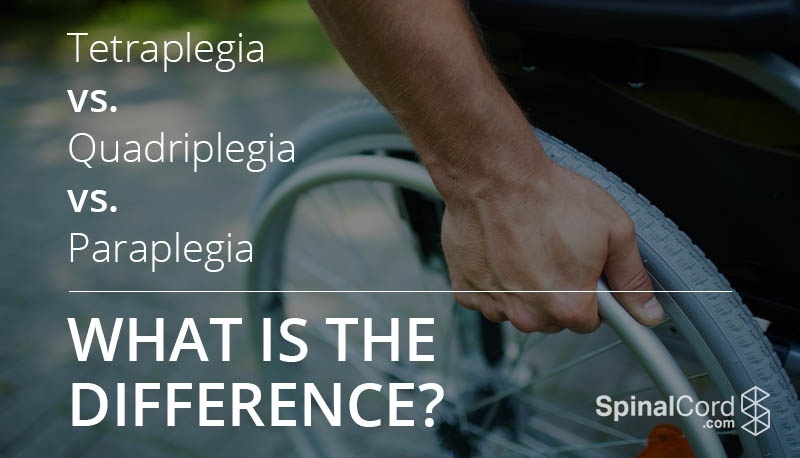 Tetraplegia vs. Quadriplegia vs. Paraplegia: What Is The Difference? When you suffer a spinal cord injury, you're not just thrust into an unfamiliar and frightening new world riddled with uncertainties. You're also stuck dissecting a seemingly endless stream of medical jargon. Understanding these terms can help you communicate more effectively with your doctors, enabling you to better understand your prognosis. Many spinal cord injury survivors are confused by the distinction between quadriplegia, tetraplegia, paraplegia. The truth, though, is that quadriplegia and tetraplegia actually refer to the same condition. Quadriplegia, sometimes referred to as tetraplegia, refers to a spinal cord injury above the first thoracic vertebra, or within the cervical sections of C1-C8. The result is some degree of paralysis in all four limbs—the legs and arms. The degree of paralysis varies depending on the nature of the injury, the extent to which you've undergone rehabilitative therapy, and oftentimes on factors that are not yet well-understood—maybe even a bit of luck. Most doctors now use the term tetraplegia to denote this injury, but patients often continue to use quadriplegia. Tetraplegia/quadriplegia can be so severe that it interferes with the injured person's ability to breathe on his or her own. Generally speaking, the higher up the injury is, the more extensive the damage will be. Paraplegia occurs in spinal cord injuries below the first thoracic spinal levels (T1-L5). Paraplegics are able to fully use their arms and hands, but the degree to which their legs are disabled depends on the injury. Some paraplegics are completely paralyzed from the waist down. Others suffer only minor mobility issues, tingling in the legs, or decreased sensations in the lower body. Not all spinal cord injuries result in tetraplegia (quadriplegia) or paraplegia. Lower spinal cord injuries can cause varying issues. For instance, injury to the lumbar region of the spine can cause a condition known as cauda equina syndrome, which interferes with bladder, sexual, and leg function.